A telephone booth shaped cube with dollars and prizes swirling around inside can be an especially effective trade show marketing tool. Participants can win a chance to spend a minute in the Cash Cube collecting as many prizes as they can. Prizes can be actual money or customized vouchers redeemable for your business’s products or services. The sight of someone flailing around in the booth is usually comical enough to stop show traffic – right at your booth! Available for rent or purchase, our Cash Cube Money Machines can be completely customized with your company logo and marketing message. For additional exposure, you can even create an inflatable money machine in the shape of your logo, product or mascot! With our wide selection of these trade show attractions, you are sure to find a Money Machine to fit your event needs and budget. Watch as the crowds curiously gather around your exhibit to get a glimpse of the excitement. While contestants are waiting to step inside, you have the perfect opportunity to connect with them! Still have questions about Promotional Money Machines? Speak to a Trade Show Promotions Specialist at 800-573-3111. Take advantage of our incredibly competitive prices on unique personalized items and custom branded tradeshow giveaways. Promotional items are often the highlight of the trade show in the eyes of attendees. 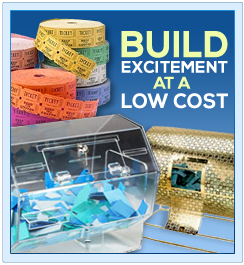 Use these tradeshow giveaways as prizes for larger promotions like the Cash Cube Money Machine or Cha Ching! Slot Machine or simply hand them out to trade show participants in an effort to increase booth traffic. The most effective tradeshow giveaways are those that are customized with your logo and that your target audience will use time and again even after the tradeshow has ended. Highly desirable tradeshow giveaways like customized bags, water bottles or T-shirts can be extremely effective in drawing attendees to your booth and creating a lasting brand impression. 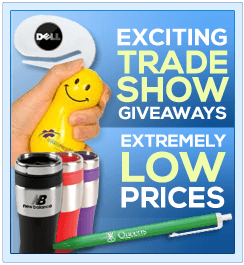 With over 750,000 promotional items to choose from, we can help you find the perfect trade show giveaway tailored to your event needs and budget that will represent your brand beyond the tradeshow floor. When it comes to building your brand image, never underestimate the power of promotional giveaways! Still have questions about Customized Promotional Products? Speak to a Trade Show Promotions Specialist at 800-573-3111. By adding the Promotional Prize Vault to your trade show marketing mix, you are guaranteed to attract attention and add excitement to your exhibit! Offer trade show attendees the opportunity to try their luck at guessing the six-digit combination that unlocks the prize of your choice inside. Allow visitors to guess randomly or have them pick from a stack of envelopes filled with possible combinations and one winning combination. When the one winner cracks the code, get ready for an explosion of energy and excitement! The durable, portable and easy to use design of the Prize Vault makes it an ideal trade show attraction. Available for rent or purchase, this convention game can be customized with your company logo. For additional exposure, opt for a custom branded pedestal to hold the machine. As contestants wait in anticipation for their chance to crack the safe, you have the opportunity to strike up a conversation with prospective clients. This unique promotion that is sure to generate a lot of buzz on the trade show floor! Still have questions about the Promotional Prize Vault? Speak to a Trade Show Promotions Specialist at 800-573-3111. Looking for an effective event attraction? Offer attendees the opportunity to test their luck with promotional scratch off cards that can be completely customized with your company logo, marketing message, and your choice of prizes. The customizable scratch off cards can be used as incentive for attendees to stop by your booth or in conjunction with a larger promotion like a Cash Cube Money Machine. Prior to the trade show, mail the scratch off cards to attendees announcing your booth location and any special promotions you will be offering. Looking for a winning strategy to drive traffic to your booth? Use numbered prizes that require attendees to visit your booth to see what they have won! You pick the prizes, size and shape of the card and our full-service art department will design the custom cards for your next event! Let’s face it, we are all familiar with the excitement and anticipation brought on by scratching off the shiny silver surface to see if we’ve won…why not bring that same energy to your exhibit? 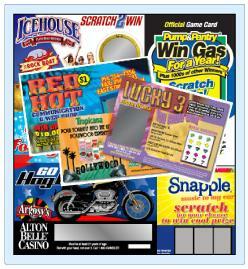 Still have questions about Customizable Scratch Off Cards? Speak to a Trade Show Promotions Specialist at 800-573-3111.
Who can pass up the thrill of spinning a prize wheel? Trade show participants will line up to spin the wheel in hopes of winning prizes, vouchers or even cash! To maximize your trade show marketing efforts, we recommend you offer prizes that are relevant to your business or industry like discount services, free products or gift cards. For ultimate exposure, pair your prize wheel with luxury promotional products adorned with your company logo. Our prize wheels are designed to fit your trade show marketing needs. Made from tough ABS and PETG plastics, our durable prize wheels are also lightweight and portable. Customizable and changeable, you can easily create your own prize slots by using the templates found on our website. 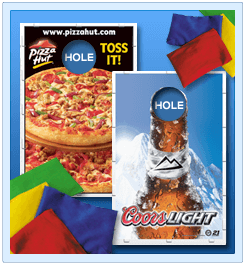 Available in various sizes and styles, you are sure to find a prize wheel to fit your trade show marketing needs. For small exhibits, try the table top mini 20” prize wheel or the 31” adaptable floor standing model. 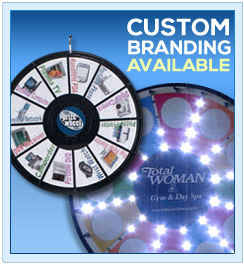 For maximum exposure, opt for a lighted prize wheel or the ultimate 72” customized model. Still have questions about Promotional Prize Wheels? Speak to a Trade Show Promotions Specialist at 800-573-3111. Attendees will jump at the chance to drop a puck down a Plinko board and watch in anticipation to see which price slot it lands in. The changeable, customizable slots give you the freedom to choose your own prizes and change them for each event! To increase your marketing efforts, offer custom branded giveaways, product samples or vouchers redeemable for your business’ products or services. Perfect for trade shows, Plinko Boards are one of the most cost effective promotional games on the market because they are designed for repeated use. Made with a powder coated steel frame and tough ABS plastic, our boards are lightweight, portable and require no assembly! By using the prize slot templates available on our website, you can customize the board yourself. Looking to magnify your marketing message? Choose the Changeable Face Plinko Board. 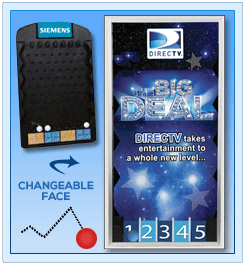 The 48” x 24” interchangeable face offers ample room to display your company logo and custom graphics. No matter what industry you are in, you’ll have trade show attendees flocking to your booth to play Plinko! Still have questions about Plinko Boards? Speak to a Trade Show Promotions Specialist at 800-573-3111. Do you want to generate serious attention? Here’s an idea; the Pick 6 Bingo Blower©! It’s the brainstorm of two American classics, Bingo and Lottery, blended together. The concept of the Pick 6 Bingo Blower© is that it’s an energizing, driven, fast paced game that sits on top of a table top. It’s the perfect way to ignite the buzz because everyone wants to play. The Pick 6 Bingo Blower© takes up to six minutes per round and supports up to 20 contestants. Tradeshow vendors want to engage the most people for the duration of the show and this is a prime opportunity to drive and keep traffic at your booth. What better way to build your client base and generate more leads that lead to sales, than with the Pick 6 Bingo Blower©. 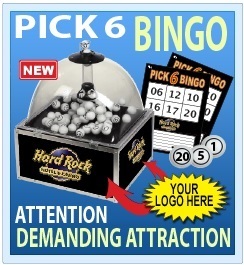 The Pick 6 Bingo Blower© is a casino-style dome top blower with a 360° view and a quiet air blower. Everything is customizable; playing cards, balls, ink daubers, table top advertising posters with stands, and a winning ball display, so you can have your logo emblazoned on your Pick 6 Bingo Blower©. The traffic ticket is YOUR ticket to trade show success! What is the Prize Decoder Traffic Ticket Promotion? It is not a “Scratch-Off” or a “Match & Win”. The Traffic Ticket system is an electronic interactive promotional technology. 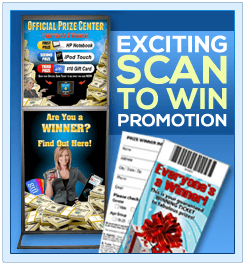 Customers simply insert the Prize Decoder Traffic Ticket into the official prize center electronic decoder and visually see what prize they have won. Also available for rent, this cutting edge promotional game can be completely customized with your company logo and custom graphics. Should you decide to purchase the machine, you can easily change the customized panels to fit any event. For maximum excitement, you can even program the video display to include sounds or videos. Mail the completely customized traffic tickets to event attendees before the trade show to announce your booth location and special promotions or prizes you are offering. Watch as attendees anxiously seek out your booth for the chance to scan their ticket and see what they’ve won. Because you have the freedom to pick the prizes, every ticket can be a guaranteed winner! Still have questions about the Prize Decoder Scan to Win Promotion? Speak to a Trade Show Promotions Specialist at 800-573-3111. 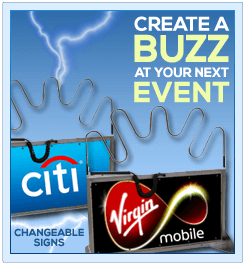 Looking for a unique trade show attractions that will electrify your audience? Look no further than the Buzzwire Game! Allow attendees to test their skill as they attempt to navigate a circular wand from one side of the machine to the other without touching the wire! This lighthearted fun-filled game is a great way to stir up a little competition between event attendees while creating the perfect opportunity to connect with potential customers. The unique design of the Buzzwire Game demands attention and draws a crowd making it the ideal trade show attraction for rent. Should attendees accidentally touch the wire, the machine makes a loud buzzing sound that alerts the entire room, drawing an even larger crowd to your exhibit! Also available for purchase, the Buzzwire Game is one of the most exciting and affordable promotional games available. The interchangeable front panel can be completely customized to include your company’s graphics. Don’t let its huge promotional power fool you, this machine only weighs 32 lbs. and can be easily transported! Still have questions about the Promotional Buzzwire Game? Speak to a Trade Show Promotions Specialist at 800-573-3111. Open up the treasure chest, and what’s inside? Promotional coupons, currency, vouchers, gift certificates, and custom branded promotional products that everyone wants to get their hands on! Trade show booth visitors won’t be able to contain their excitement when you hand them a key and invite them to try their luck with opening the treasure chest. Will their key fail, or are they one of the lucky ones with a winning key to get at the treasure? You decide how much booty to give away, because you have total control over the ratio of winning to bogus keys. You can pick the exact number of winning keys you want, allowing you to control exactly how many vouchers or coupons you’ll give away. Trade show attendees won’t be able to pass by your booth when they see the real wood treasure chest sitting there begging to be unlocked. They’ll want to step up and give this event attraction a try, giving your trade show staff the perfect opportunity to strike up a lead-generating conversation! 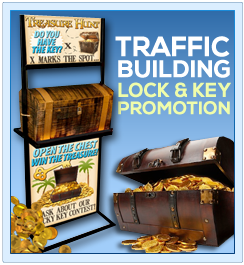 Still have questions about Treasure Chest Promotions? Speak to a Trade Show Promotions Specialist at 800-573-3111. Everyone knows it…Everyone loves it… Toss N’ Win is America’s favorite bean bag toss game! Event attendees won’t be able to resist the chance to test their skill as they attempt to toss a bean bag into a hole on a custom board from feet away. This lighthearted, fun-filled convention game is sure to draw a crowd and create a little friendly competition among booth visitors allowing you the chance to strike up conversations and generate leads. Toss N’ Win features two large boards measuring 21” x 31” that provides you with an abundant space to display your company logo and custom graphics. Designed by our in-house art department, the full color custom graphics can be seen from across the trade show floor. For additional exposure, opt for custom branded bean bags. Weighing in at a mere 22 lbs, this corn hole game is the ideal promotional attraction for any event! Made with durable plastic, it can be easily transported and set up. Simply set it up and watch the fun begin! Still have questions about Toss N’ Win Trade Show Games? Speak to a Trade Show Promotions Specialist at 800-573-3111. Customizable raffle drums enhance your booth’s style, drive tons of traffic, and get people returning to your booth again and again. Because raffle promotions are so well known and easy to use, event attendees won’t hesitate to stop by your booth to grab a few raffle tickets as they browse the trade show. In order to see what they’ve won, they will have to return to your booth, giving you TWO opportunities to connect with each booth visitor. As part of your pre-tradeshow marketing plan, mail out pre printed tickets to key attendees and invite them to stop by for the big drawing. Along with the location of your booth, be sure to include the prizes and promotions you will be offering at the show. Boost your leads acquisition by having visitors pick a prize coupon from the raffle drum when they complete your contact card. We offer a variety of raffle drums available to fit your event needs. Raffle drums can be used repeatedly for multiple events and promotions, making them one of the most cost effective promotional tools on the market! Still have questions about Raffle Promotions? Speak to a Trade Show Promotions Specialist at 800-573-3111. What’s the quickest, most effective way to get to your customer’s hearts? Through their stomachs, of course! As event attendees are browsing the trade show floor, the delicious smell of your popcorn is sure to capture their attention and draw them to your exhibit offering you the chance to connect with attendees and generate leads. Our stock models are available for rent and can be customized with a vinyl transfer displaying your company logo and marketing message. Choose from a number of different machine designs, all of them offering customization options so that your logo will be front and center. Should you choose to purchase a Popcorn Machine, you can choose the color, design and customization options! 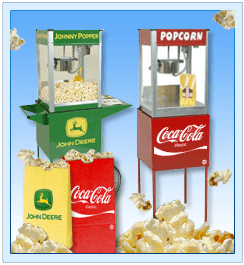 Custom Popcorn Machines are the ideal attraction for a variety of indoor and outdoor events. For an even stronger impact, get your logo put on the popcorn bags. Your visitors will walk around enjoying their popcorn long after they leave your display, but your company (and your popcorn) will still be on their minds and stomachs! Still have questions about Customized Popcorn Machines? Speak to a Trade Show Promotions Specialist at 800-573-3111. Capturing the attention of event attendees is often the most difficult part of exhibiting. Your goal is to stand out from the rest of the competition on the trade show floor. In order to do so, you must add an exciting, traffic stopping attraction to your marketing mix. Our show stopping robots are guaranteed to do just that! We offer a variety of promotional robots for rent, each with its own unique ability to capture the attention of your audience. Our robots perform everything from handing out promotional products to booth visitors to reciting a 40 minute speech about your products and services. Your booth visitors are sure to be stunned by these state-of-the-art promotional tools! The gorilla robot adds a whole new dimension to our robot roster. At over 6 feet high with full animatronic arm and torso movements and available in many bright colors (and original natural), this guy is sure to grab attention. 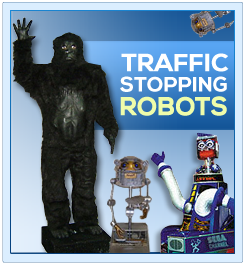 Spell out a message on a 21″ x 36″ sign and let the gorilla robot do the advertising for you! Still have questions about Promotional Robots? Speak to a Trade Show Promotions Specialist at 800-573-3111. Let’s face it, nobody can resist the chance to step inside a portable photo booth and get their picture taken! Make your trade show truly memorable by sending your guests home with a picture. As event attendees are waiting in line to get their picture taken, you have the perfect opportunity to pass out promotional material and generate leads. Rent a photo booth at your next event and watch as the crowd gathers around your exhibit. Each photo booth breaks down into a convenient road case making it easy to set up and ship to any location. Available in different styles, each machine comes equipped with customizable side panels, acting as a giant billboard that can be imprinted with your company logo. As attendees exit the photo booth, they’ll get an automated printout of their photo that they can take with them right away. Turn that printout into an even more powerful marketing tool for your brand by customizing it. Put your logo on the photo strip making your visitors remember where their fun photos came from! 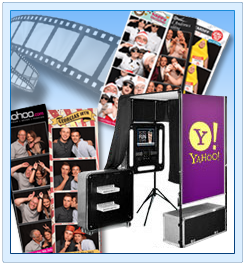 Still have questions about Promotional Photo Booth Rentals? Speak to a Trade Show Promotions Specialist at 800-573-3111. Your goal as an exhibitor is to capture the attention of trade show attendees and introduce them to your products and services in hopes of building relationships with potential customers. You must provide an interesting attraction that evokes curiosity in your booth. Video Game Attractions offer attendees a welcomed escape from the trade show, which offers you the opportunity to connect with them. We offer a variety of Video Game Attractions for rent. These convention games range from small table top models to large floor standing models, all with a unique game that appeals to the masses. Also available for purchase, each Video Game Attraction can be completely custom branded. 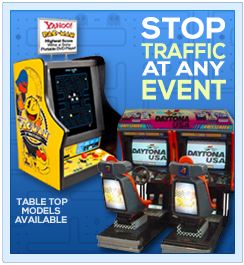 Showcasing Pac Man, Ms. Pac Man, Galaga and other video game attractions in your trade show exhibit is a surefire way to attract a crowd. Everyone that played these classic games as a kid can’t help but stop for a challenge! People hang around to watch the game, conversation ensues, and great connections are made when you include video game attractions in your trade show exhibit. Still have questions about Video Game Attractions? Speak to a Trade Show Promotions Specialist at 800-573-3111. The Cha-Ching! 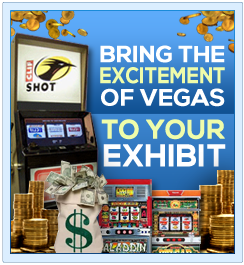 Slot Machine offers all the excitement of a Vegas Slot Machine right in the middle of your trade show booth! Equipped with the lights and sounds of a real slot machine, minus the coins, you are sure to draw a crowd of interested event attendees who are eager to pull the level and win a prize! Available for rent, the Cha-Ching! Slot Machine is guaranteed to make your booth irresistible to every attendee who passes by. This event attraction dispenses customized vouchers and coupons instead of coins, offering you another opportunity to market to potential leads and customers. You determine the prizes and the odds of winning. For added exposure, offer custom imprinted promotional products as prizes that will carry your brand beyond the trade show floor. Larger prizes work well with an ongoing booth contest to generate media coverage and high participation. Smaller prizes, on the other hand, ensure that all participants who register get a chance to pull the lever and win a small promotional item or discount on your products or services. 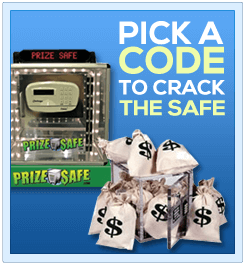 Still have questions about Promotional Slot Machines? Speak to a Trade Show Promotions Specialist at 800-573-3111. 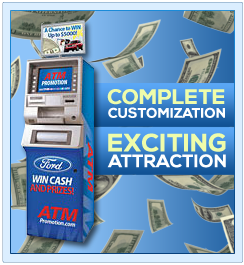 The latest customizable promotion that’s sure to draw crowds is the Promotional ATM Machine! After all, who can resist the temptation of swiping a card to see if they’ve won cash or prizes? Resembling a real ATM Machine, it even dispenses real notes or coupons, prize vouchers, gift certificates and customized bills from your business. All it takes is one swipe of a promotional card that has a magnetic strip! You can also program it to dispense a custom coupon to every eager attendee who uses it. Rent the Promotional ATM machine and customize it with vinyl graphics and additional signage displaying your company logo and marketing message. Consider purchasing a completely customized ATM Machine that can be used at virtually any event. 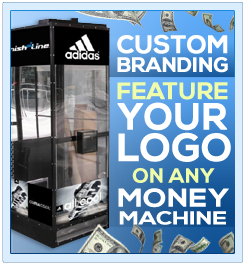 You can brand it and make your message be seen and remembered with this authentic Promotional ATM Money Machine. Each machine can be programmed to display through and scroll up to 8 pictures or custom messages on its 10-inch color monitor. With the Promotional ATM Machine, you’re sure to stop traffic at any event! Still have questions about Promotional ATM Machines? Speak to a Trade Show Promotions Specialist at 800-573-3111. Are you worried that your trade show marketing efforts will be lost because you couldn’t afford a huge exhibit space in a prime location? Looking for a tried and true marketing promotional that will attract attention? 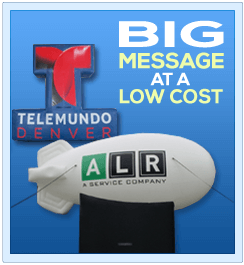 You are sure to be noticed with a larger-than-life Customized Promotional Balloon hovering over your booth! 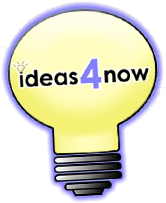 One you have captured the attention of attendees, you will have the opportunity to market to them and generate leads. We have a variety of custom inflatable balloons for sale that have proven to be successful marketing tools for a variety of events and promotions. Typical models like blimps, dollar signs and hot air balloons can all be customized with your company logo and marketing message. Each balloon requires very little set up and can be easily transported when deflated. For ultimate exposure, create a custom inflatable in the shape of your logo, mascot or product! Perfect for product launches, grand openings, trade shows and a variety of events, our giant customized Promotional Inflatables deliver a HUGE message at a low cost! Still have questions about Custom Inflatables? Speak to a Trade Show Promotions Specialist at 800-573-3111. …to create a lasting impression on clients so that your brand, your products, and your offer are burned into their minds long after the trade show ends. Bringing trade show attractions and games to your exhibition booth is an ideal way to generate leads – and more leads mean more sales! Attendees line up to fill out your contact form, for a chance to try their luck at the Plinko board, draw from your raffle drum, grab at cash inside the Money Machine, try to crack the code of your Prize Safe, or spin your Wheel of Chance. These exciting trade show attractions allow you to collect contact information for leads, and keeps them engaged at your trade show booth long enough to engage in conversation, hand out brochures and flyers, and offers a memorable way to hand out your logo imprinted trade show giveaways in the form of prizes! For many companies, trade shows are the most powerful marketing they do all year. The contacts generated from one successful trade show event are often enough to keep your sales people busy all year round. Don’t let your competitors take the lion’s share of the leads. If you’ve made the commitment to exhibit at your industry’s big trade show, make the commitment to get the absolutely most value from the experience possible. Enjoy a complimentary consultation with one of our trade show marketing experts for fresh, fun trade show marketing ideas and to choose the trade show attraction that best fits your marketing plan!